(Nanowerk Spotlight) A conventional optical microscope equipped with an oil immersion objective can resolve objects no smaller than about 200 nanometers – a restriction known as the diffraction limit. The diffraction limit, which typically is half the width of the wavelength of light (λ) being used to view the specimen, represents the fundamental limit of optical imaging resolution. Breaking this limit is possible by very sophisticated techniques and costly instrumentation. Now, though, researchers in Switzerland have found that when putting a transparent dielectric particle on top of an object with nanoscale features, details of that object with a size corresponding to ∼λ/7 can be resolved using a conventional microscope objective. "We achieved super-resolution imaging of nanostructures with sub-diffraction feature sizes by using a microsphere nanoscope in combination with a conventional water or oil immersion objective," Martin Gijs, a professor at Ecole Polytechnique Fédérale de Lausanne (EPFL), tells Nanowerk. "Our fluorescence experiments performed in water show that an object with a size as small as one fourth of the diffraction limit can be quantitatively determined, while a 5.4 × magnification of the image is obtained." Reporting their findings in the December 19, 2013 online edition of Small("Super-Resolution Biological Microscopy Using Virtual Imaging by a Microsphere Nanoscope"), Gijs and his team demonstrated the potential of the technique by resolving the structure of fluorescently stained centrioles, mitochondria, chromosomes, and study the effect of doxycycline treatment on mitochondrial encoded protein expression in a mouse liver cell line. For their technique, the team used transparent barium titanate glass microspheres that are simply put on top of an object that is immersed in liquid medium. 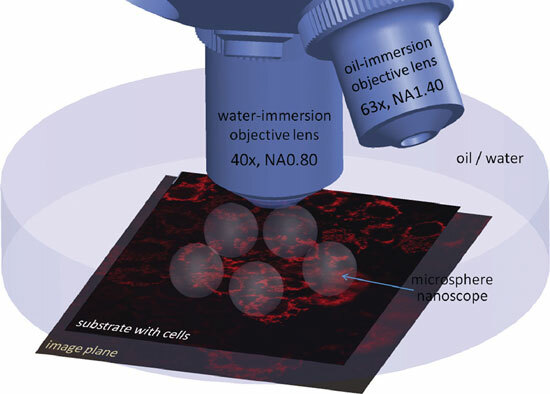 Putting particles (60 µm microspheres) onto an object of interest gives access to nanometric details (down to 100 nm in water) of it and allows easy observation of the image via a conventional microscope objective. "These particles are easily available commercially and at virtual no cost," says Gijs. "The super-resolution feature of the particle is associated with the existence of a so-called photonic nanojet that emerges from the bottom of such a particle, depending on appropriate choice of the particle size and the refractive index, when the particle is illuminated from the top." While this optical phenomenon has been known and demonstrated for controlled nanostructures, the EPFL team provides first results on the imaging of biological objects such as centrioles, mitochondria, and chromosomes. This technique effectively converts a standard laboratory microscope to an instrument with super-resolution capability without extra cost. Gijs points out that the demonstrated fluorescent superresolution microscopy in water indicates that the technique could be extremely interesting for life science applications. "We think that in future, due to the straightforwardness of our approach, microspheres will provide a robust and versatile tool that can be used to image with a conventional microscope a variety of biological objects such as viruses, nucleic acids, and functional organelles in living cells," he concludes.